Taff Vale Railway Loco` 267 by Colin Binnie. This little fellow was ordered off the shelf from Hudswell Clarke in September 1876 and delivered about November of the same year. A slightly smaller version had been obtained in June but we shall not worry about that here. Our engine-maker's number 166 became Tafia Vale Railway 107 and ran more or less in original condition until 1895. In that year it was rebuilt at Cardiff Works, returning to traffic in February, 1896. 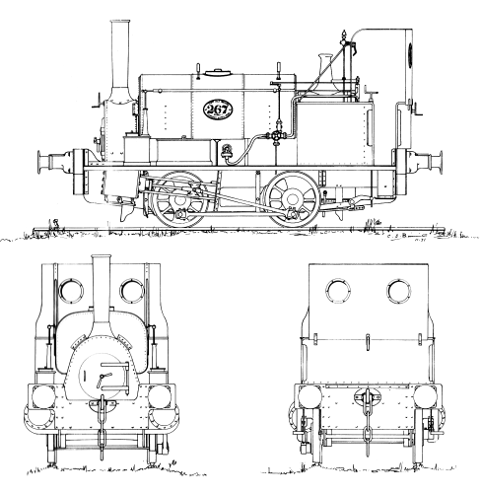 In 1892, however, the engine was renumbered as 267 and at about that time has been made the solitary representative of Class S .
It is with the rebuilt engine that we are concerned here and it forms the subject of our drawing this month. In the form depicted it was sent to Cathys shed and worked as pilot at the West Yard Locomotive Works. Here it stayed for the rest of its working life, collecting in turn a set of improvised cab extensions, a set of chain dogs on the R.H.S. 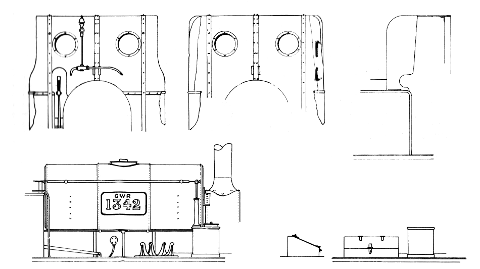 footplate, a set of G.W.R. number plates and, finally, a tool box to replace the chain dogs. At the grouping it became G.W.R. No. 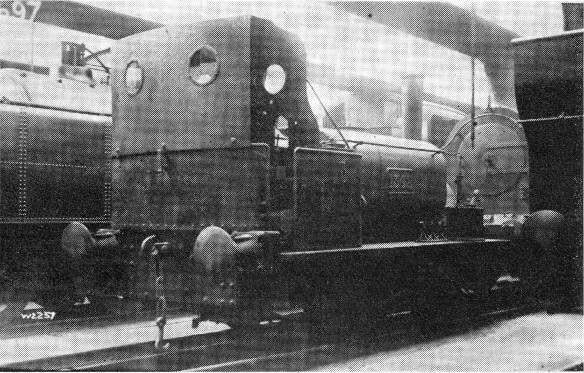 1342, though it had been transferred to departmental stock in 1920. In 1925 it was declared redundant, the job at West Yard Loco Works was taken over by Trovan , an ex-Alexandra Docks Railway Co. 0-4-OST, which had just undergone heavy repair. No. 267 was sent to Swindon in November 1925, where it was placed in the Dump until final scrapping at the end of 1926. 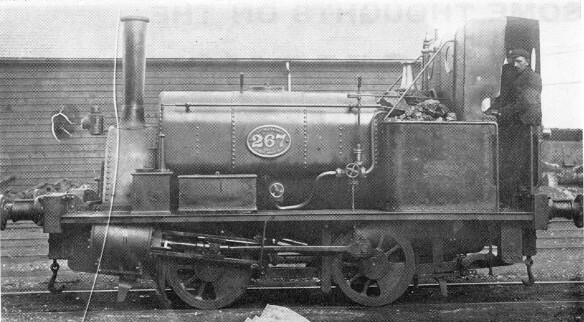 No 267 appeals to me because of her solid, settled-down look; those deep buffer beams and that squat saddle tank make her look as if she could pull something. Unlike her Manning Wardle cousins of the period which remind me of elderly Victorian spinsters, all angular chin and elbows, doing the same work as the lower classes but distaning to look as if they could do anything. Enough of my flights of fancy. Here are the dimensions of No 267. *The original wheel diameter of 2ft 9in. was increased at the rebuild to 2ft 11in, but seems to have shrunk back to about 2ft 9in during the ensuing years. The most likely explanation is that thicker tyres were fitted, which were gradually reduced by wear and re-turning the profile. 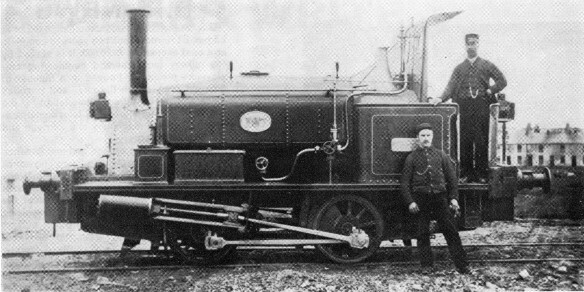 Top: Class S as originally built. number 107 fully lined out and very clean. Middle: G.W.R. number 1342 with chain dogs and still in service. Bottom: Number 267 more or less as drawn. Cab front details showing whistle piping, reversing lever etc.